Two years ago, I never thought I'd be starting a craft blog. In fact, two years ago, I didn't even know how to do any sort of yarn craft. However, this is now, I do know how to knit and crochet, and I am obsessed. It all started last winter when I was playing a gig with my now ex-band, Doppelgänger Effekt. We were playing in this old hotel turned hippy commune, and there was no heating. Now, I played violin in this band, and, for those who aren't musicians, cold fingers equals not being able to play, but gloves make it impossible to play as well. However, a girl there was kind enough to lend me some really neat wrist warmers that warmed my palms enough to keep me agile, while leaving my fingers free to feel the strings. I was so impressed with the wrist warmers, that I decided to learn how to crochet (since knitting seemed much harder at the time) and make my own pair. Diving into my Mom's yarn stash for an appropriate skein, I picked out a nice black worsted weight yarn and begun my project from this pattern. There was much swearing and complaining (since it was a fairly complicated project for a rank beginner), but with the helpful guidance of my mother, I was eventually able to finish those gloves. I ran out of black yarn part way through the second one, so they ended up being a little mismatched, but I was very proud of my first project. 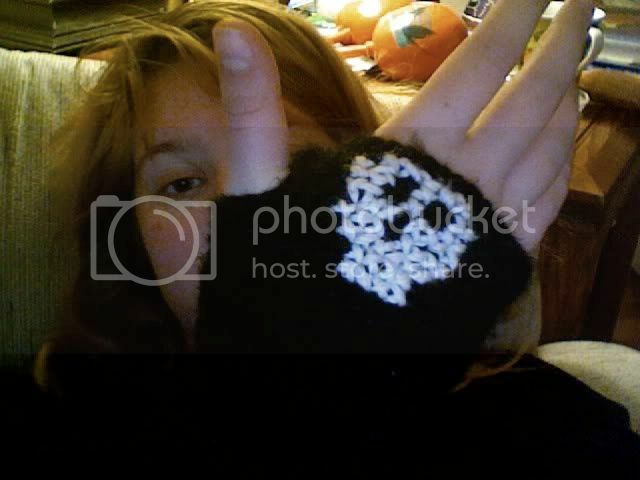 I even embroidered a skull on one of them. 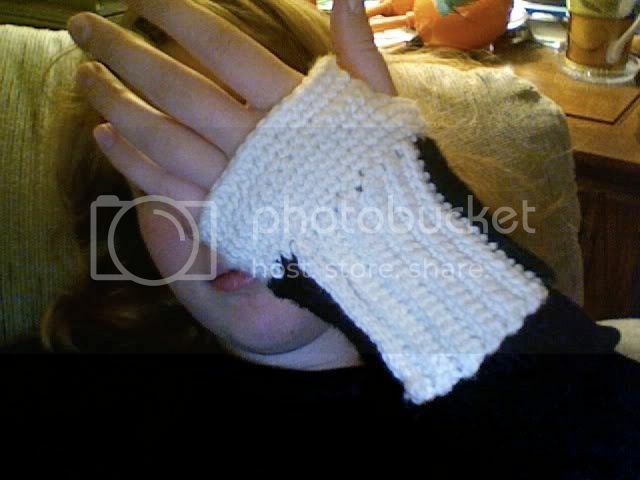 These fingerless gloves started me on a journey that would lead me to buy countless craft books, learn more advanced crochet techniques, eventually learn how to knit, and start writing my own patterns. I inherited my grandmother's yarn stash, giving me even more fodder for my idle hands, and, when I moved to Toronto in September to start my PhD in Astrophysics, I discovered the wide world of yarn stores, having had to rely on Zellers yarn in the small town where I grew up. The idea of starting a craft blog popped into my mind a few weeks ago when I started reading Bittersweet, which is primarily a vegan baking blog, but has some fantastic knitting and crochet patterns as well. I figured that I can share, or at least chronicle for myself, the evolution of my crafting abilities, and keep track of all the crochet and knitting projects I've completed. So, here, dear Internet, is the beginning of Off the Hook Astronomy.